At the top left of the PostMania notification page, click on Sort by Topic and select Sort by Diagram from the popup menu. The thumbnails of diagrams shared to you are presented on the screen. 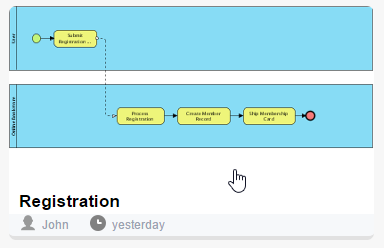 If the diagram you want to view is in another project, click on the down arrow next to the name of the current project and then select the desired project from the popup menu. Click on a thumbnail to open the diagram. 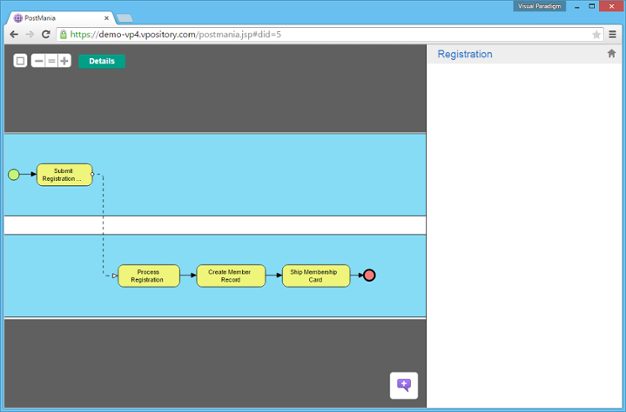 Once you have opened a diagram, you can view it in PostMania. Here we are going to see some of the functions that help you in viewing a diagram. On the top left of screen there are several buttons you can click to zoom the viewing diagram in and out. Zoom to fit - Click on it to fit the width and/or height of Web browser. Note that if you resize the browser after clicked zoomed, you need to click again to make the diagram size follow the updated width and height of the Web browser. Zoom out - Click on it to reduce the size of image, hence causing a larger portion of diagram content visible. This is particular useful when the diagram being viewed is very large in size. Actual Size - Click on it to restore the scale to 100%. Zoom in - Click on it to magnify the diagram. Usually, diagram is so big that you cannot view everything within the viewing region. Zooming can help but may make the diagram content hard to read. Therefore, in most cases you can view only part of the complete diagram. If you want to view the other parts of the diagram, simply press on the diagram and drag it. You can drag to any direction you want. Besides diagram, you can read the description of model elements, if specified. Click on the shape you want to read its description. If you want to read the description of diagram, click on the background of diagram. At the top of the page, click Details. The description is then presented at bottom left. When you finish reading, click on the back button to go back to the diagram. You can then select another shape to read its description. If the shape has references added, you can see the REFERENCE tab appear next to the DESCRIPTION tab. You may open the tab to review the list of references. The following resources may help you learn more about the topic discussed in this page.